Below is a brief history of the 4th Iowa volunteer infantry as a regiment of the Army of the Southwest. For this and two additional histories download the pdf titled: History of the 4th Iowa Volunteer Infantry. For a complete roster of the regiment by soldier name, company, home, birthplace, and short annotation of his career click here. 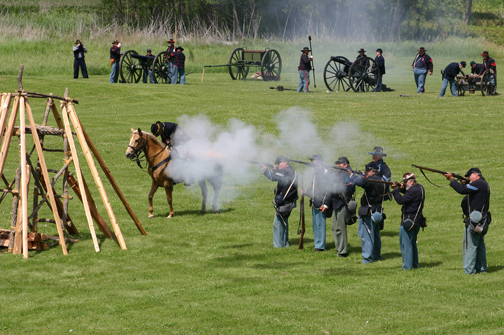 The Fourth Iowa Infantry was organized under the proclamation of the President, dated May 3, 1861. The companies composing the regiment were mustered into the service of the United States at Camp Kirkwood , near Council Bluffs , Iowa , and at Jefferson Barracks, near St. Louis , Mo. , on different dates, ranging from August 8, 1861, to August 31, 1861. The discrepancy in the dates and places of muster in of the companies is accounted for by the official records in the office of the Adjutant General of Iowa, which show that Colonel Dodge was ordered to employ the companies which first reached the designated rendezvous at Council Bluffs, in an expedition to the southern border of Iowa, to repel a threatened rebel invasion of the State. In his official report, the Colonel states that the rebel force, that was being organized, disbanded and scattered upon the approach of the Iowa troops, and the object of the expedition was accomplished without a convict. In the meantime the other companies, as they arrived at rendezvous, were ordered to proceed to St. Louis , in pursuance of orders from General Fremont, the exigencies of the service requiring the rapid concentration of troops at that place. By the 15th of August, all the companies, except I and K, had reached Benton Barracks. Colonel Dodge further reports that the eight companies which had reached the barracks left there on the 24th of August, for Rolla , Mo. , where they joined the troops being concentrated there, and became a part of the Army of the Southwest under General Curtis. The remaining companies—I and K—were not mustered into the service until August 31st and did not leave Benton Barracks until September 13th, when they were sent forward to Rolla, where the full ten companies composing the Fourth Iowa Infantry were for the first time in camp together. This regiment was made up largely in the southwest portion of the State. Company A was from Mills County; Company B. from Pottawattamie, Harrison, Cass and Shelby; Company C, from Guthrie and Dallas; Company D, from Decatur and Clarke; Company E, from Polk, Warren and Dallas; Company A, from Madison and Warren; Company G from Ringgold; Company H from Adams and Union; Company I from Wayne; Company K from Taylor and Page. The first field officers were: G. M. Dodge, colonel; John Galligan, lieutenant-colonel; W. R. English, major, and J. A. Williamson, adjutant. The regiment went into camp at Council Bluffs in June and July, 1861, and, early in August, was ordered to Missouri , and was in camp at St. Louis and Rolla for some time, drilling and preparing for active service in the field. It was in Curtis' army in the campaign which closed with the Battle of Pea Ridge, in which Dodge commanded a brigade, and the Fourth Regiment was under command of Lieutenant-Colonel Galligan, who was wounded in the battle and resigned, April 3d, when Adjutant J. A. Williamson was promoted to lieutenant-colonel, and Lieutenant R. A. Stitt became adjutant. The Fourth was in the thickest of the fight at Pea Ridge on both days, and did excellent service, losing nearly one-half of its entire number in killed, wounded and missing. Dodge and Williamson were among the wounded. In the first day's battle, on the 7th of March, 1862, the Fourth Iowa, in the brigade commanded by Colonel Dodge, fought like veterans. Early in the day, General Carr's Division, on the right wing of Curtis' army, assailed by overwhelming numbers, made a most determined fight. For seven hours the Rebels pressed on his lines, and his division was forced back half a mile, while presenting an unbroken front to the enemy. The Fourth Iowa and Thirty-fifth Illinois, under Dodge, lying behind an old fence, were now attacked by a greatly superior force supported by artillery. The charge was met by a deadly fire and the enemy driven back in confusion. Again and again the Rebels rallied and renewed the attack and were each time repulsed with heavy loss. 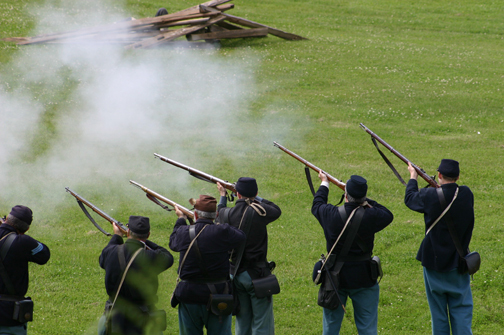 At one time the ammunition became exhausted and the Fourth made a gallant bayonet charge under the direction of General Curtis. The splendid fighting of the Fourth Iowa and Thirty-fifth Illinois challenged the admiration of General Van Dorn and other Confederate officers. For brilliant services in this battle, Colonel Dodge was made a Brigadier-General; Williamson was promoted to colonel; Captain Burton to lieutenant-colonel. Having driven the Confederate army out of Missouri , General Curtis marched toward Little Rock . The continuous rains rendered the roads nearly impassable and after remaining at Batesville and Jacksonsport several months, and finding it impossible to subsist his army in that country, he marched to Helena . A number of cotton speculators followed the advance of the Union army to reap rich harvest in getting possession of that staple. General Curtis, in attempting to control these rapacious speculators and use the cotton in a way to bring the greatest benefits to the Government, made enemies of many influential men of wealth, who were looking solely to personal gain. Helena and the surrounding country had a large slave population. As the negroes came into the Union lines the commanding General found another serious problem confronting him. Our Government had adopted no settled policy to govern the action of the department commanders in the matter and each had to act upon his own judgment. The Fourth Regiment remained at Helena until December, when it joined General Sherman's expedition against Vicksburg and took a prominent part in that campaign, which terminated so disastrously to the Pinion cause. The fourth fought in many engagements throughout the southern states until mustered out of United States service July 24, 1865, Louisville , Ky.